This was shared on my SportCruiser forum but it can be useful to everyone in regards to traffic pattern entry at non towered or pilot controlled fields. After reading this, looks like we're all doing things wrong at my home base. We pretty much all use plane make and color. My instructor use to say "red and white light sport" and I've since gone to "red and white experimental". Of course if we all used our call signs the guy at the unicom desk would stop periodically asking for them. rcpilot wrote: After reading this, looks like we're all doing things wrong at my home base. We pretty much all use plane make and color. My instructor use to say "red and white light sport" and I've since gone to "red and white experimental". Of course if we all used our call signs the guy at the unicom desk would stop periodically asking for them. That must be a local difference, almost nobody does that around here, it's always make (or "experimental") and N-number. It wouldn't work here well anyway, where we have three flight schools regularly using the airport and all fly white Diamonds. "White Diamond? Which of the three in the pattern?!?" I can see in a more rural area (we are fairly close to the ATL class B) that might work perfectly well. And even here it would "mostly" not be confusing. Remember that advisory circulars are just that (advisory, not regulatory). That said, I have to respectfully disagree with this one. Transmitting your registration number at an airport that lacks an ATC presence provides other pilots with no useful information whatever! Another plane in the pattern probably can't read your N number (nor should the pilot even try). You want them to identify you. "White low wing," "green high wing," "red light sport," "blue biplane," and "yellow cub" (aren''t they all yellow?) make it much easier for someone to know who they're following or looking for. I agree Paul. I frequently call a plane that reported somewhere to ask his current location. There is no way I can or would remember his aircraft number. I think I could remember yellow cub. drseti wrote: Remember that advisory circulars are just that (advisory, not regulatory). That said, I have to respectfully disagree with this one. Transmitting your registration number at an airport that lacks an ATC presence provides other pilots with [b]no useful information whatever! 1) Local pilots can discern who you are if they’re familiar with your plane. 2) It will let them know there are two [i]different white CT’s inbound, let’s say. 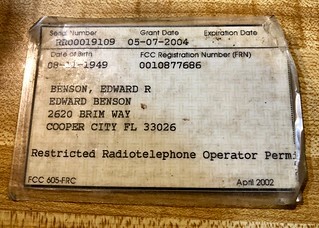 3) I thought the FCC required all radio transmissions include the identity of the transmitter. Not sure “yellow cub” meets that requirement. (3) is true if you are an FCC licensee. Since aircraft station licenses and operator permits haven't been required in the US since the Reagan administration, I doubt that's incumbent upon airmen (or enforceable). Position is the most important information. Registration info is somewhat useful, because it’s unique. Color is kind of useless, IMO. You can’t see airplane colors unless you are VERY close and they are not unique. Let me blame the Law of Primacy. For newbies, back in the antediluvian era, dinosaurs needed Radio Station Licences and Restricted Radiotelephone Operator’s Permits to use the radios in their aircraft. The Radio Station License was, in fact, the second “R” in “ARROW”. But I still thought the FCC frowned on transmissions without a station identifier. If that’s no longer the case, this old dog can reluctantly learn new tricks! Edited to add: Look what I held onto! I think the post-deluvian dating is because the Bahamas required one - I don’t know if they still do. So you don't descend on top of another airplane in the traffic pattern at traffic pattern altitude. I had 2 instructors ... one always preferred to cross at pattern altitude , his motivation being that at that height you can see everyone and everyone can see you. The other instructor always followed FAA recommended style of +500 feet tear drop entry taking it a few miles past downwind. I personall prefer the tear drop entry. You would fly TPA +500 when you are crossing over the field to observe what is going on below or if you are going to do the teardrop entry to the downwind. If you are flying in from the NON pattern side and want to turn on to the downwind leg then you come over midfield at TPA and yield to any preferred 45 degree entry or downwind traffic. I would never simply cross over an airport at pattern altitude for any reason.